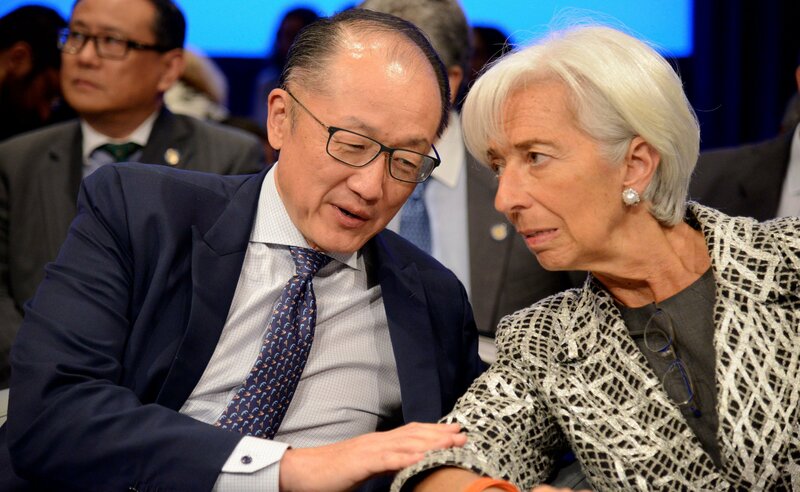 The International Monetary Fund (IMF), concerned with the world’s rising debt profile, has urged governments to use the current strong economic growth to strengthen their finances, warning that high debt makes governments’ financing vulnerable to sudden changes in market sentiments. “Countries should use the window of opportunity afforded by the economic upswing to strengthen the state of their fiscal affairs,” the IMF advised in its blog, the IMFBlog, Wednesday 18, 2018. The IMF said global debt hit a new record high of $164 trillion in 2016, the equivalent of 225 percent of global GDP, and that both private and public debt have surged over the past decade. “High debt makes government’s financing vulnerable to sudden changes in market sentiment. It also limits a government’s ability to provide support to the economy in the event of a downturn or a financial crisis,” it said, adding that the April 2018 Fiscal Monitor explores how countries can reduce government deficits and debt in a growth-friendly way. Of the $164 trillion, 63 percent is nonfinancial private sector debt, and 37 percent is public sector debt, with advanced economies responsible for the most global debt, it said. However, the fund pointed out that in the last ten years, emerging market economies have been responsible for most of the increase with China alone contributed 43 percent to the increase in global debt since 2007. In contrast, the contribution from low-income developing countries is barely noticeable. High levels of sovereign debt could make it difficult for governments to refinance when their debt reaches maturity, especially if financing conditions tighten, the IMF said, warning that large debts also impede the ability of nations to increase spending if their economies fall into recession, and may cause a drag on growth. “Countries with elevated government debt are vulnerable to changing financing conditions, which could hinder their ability to borrow, and put the economy in jeopardy. Furthermore, historical experience shows that high debt and deficits in a country increase the depth and duration of a recession—such as in the aftermath of a financial crisis—because governments are unable to deploy sufficient fiscal support to the economy, as discussed in the October 2016 Fiscal Monitor,” it noted. The IMF said countries should take decisive action to rebuild their fiscal buffers so they can increase spending during hard times. The fund urged the U.S., whose budget deficit is expected to surpass $1 trillion by 2020, to “recalibrate” its fiscal policy so government debt-to-GDP levels decline over the medium term. On what should fiscal policy do, it said its forecasts indicate that debt-to-GDP ratios would come down over the next three to five years in most countries. But this hinges on countries delivering fully on their policy commitments. There is no room for complacency. “In the April 2018 Fiscal Monitor, we urge policymakers to avoid fiscal policies that provide unnecessary stimulus when economic activity is already picking up. Instead, most advanced, emerging market, and low income developing countries should deliver on their fiscal plans, and put deficits and debt firmly on a downward path. They should also enact fiscal reforms that increase productivity and promote human and physical capital. “It is imperative that low-income developing countries strengthen their tax capacity. This will allow them to service their debt. It will also allow them to finance spending priorities—such as health, education and public infrastructure—to attain the 2030 Sustainable Development Goals. “No one can predict the ebb and flow of countries’ economies. Prudent and successful governments prepare in good times to face the storms looming on the horizon,” it posited.